Pharmacies and pharmacy services must be able to show they are quality providers and guarantee high-quality services that lead to successful therapeutic outcomes. Similarly, payers are demanding more evidence that their patients are receiving a high quality of care that will ultimately lead to cost-­savings. With the implementation of the Affordable Care Act, an average of 12 million people are expected to be covered over the course of 2015.1 In addition, average annual enrollments are expected to increase to 21 million people in 2016 and then to 24 million to 25 million people each year between 2017 and 2025.1 That said, the call for increased participation from pharmacists has never been more apparent or needed. Programs and initiatives that focus on integrating medication therapy management and reconciliation services and increasing patient involvement are key to helping improve quality, but how are these services validated? In addition, how are payers assured that their patients are receiving consistent quality management across the board? These are not just high-priority questions for payers, but also for patients. Because the push for increasing patient involvement is a key factor to success, the nation’s pharmacists and national businesses must be able to provide reassurance that their patients are receiving high-quality care. How can these businesses show payers and patients that their models work? The answer, in part, may lie in accreditation. According to the Utilization Review Accreditation Commission (URAC), a leading organization in the field, “accreditation is an evaluative, rigorous, transparent, and comprehensive process,” wherein a healthcare organization has its systems, processes, and performance examined by an impartial, external accrediting organization.2 This is done to ensure that business is conducted in accordance with national standards and in a manner that fulfills predetermined criteria. Accreditation is by no means a new topic, but it is gaining momentum; a quick Internet search for URAC or the Accreditation Commission for Health Care (ACHC) brings to light just how active these organizations are within the healthcare industry. Businesses are becoming increasingly aware of the need for and potential advantages of accreditation. Currently, the leading accreditation bodies in the industry are URAC and ACHC, and they validate whether an organization is committed to providing the highest quality of care to patients. From accountable care organizations and drug therapy management programs to dental networks, the broad range of programs eligible for accreditation is continuously growing. 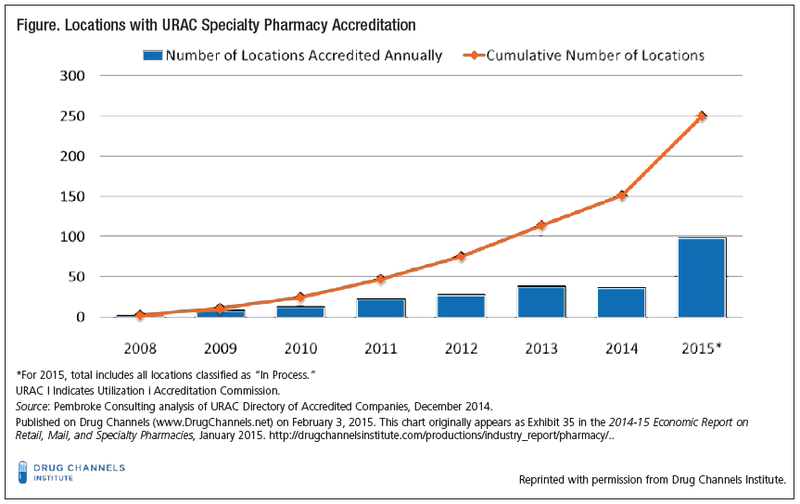 An excellent example of the growth in accreditation can be seen in the Figure,3 which highlights the growth in specialty pharmacy accreditations conducted through URAC from 2008 to 2015. This Figure was specifically developed to highlight the growth in specialty pharmacies, and the increase in self-proclaimed specialty pharmacies authenticating their services. The Figure focuses on the number of specialty pharmacies accredited annually, as well as the total number of specialty pharmacies accredited to date. Comparing the approximately 100 specialty pharmacies set to become accredited by the end of 2015, with the fewer than 50 that were accredited in 2014, the evidence is clear that specialty pharmacies will continue to focus on accreditation as a means for certifying their services. Keep in mind, though, that this chart does not include the specialty pharmacy accreditations issued by ACHC. Because URAC and ACHC are nationally recognized, one would imagine that for pharmacies receiving accreditations from such reputable organizations, it could open up the doors to previously closed channels and ultimately lead to a healthy return on investment. One of the best examples of how accreditation is influencing the industry can be seen through the recent actions taken by a leading pharmacy benefits manager (PBM). The PBM Catamaran Corporation is taking an approach that may be replicated often in the near future. It is critical for a PBM the size of Catamaran to instill as much consistency into their process as possible. To implement such discipline within their system, they require that specialty pharmacies processing claims for their patients go through an accreditation process if they wish to stay within Catamaran’s network. Outside pharmacies that have yet to be accredited will be required to transfer the prescriptions of Catamaran participants to either BriovaRx or another pharmacy that is accredited. The impact their actions have will be significant considering that they are one of the largest managers of pharmacy benefits in the market. In addition, requiring accreditation accomplishes a few different tasks: First, it serves as a model for their preferred network and increases the claims being processed through their specialty pharmacy sites; second, it will reduce the number of claims being relayed by different pharmacies; and lastly, it will develop structure in the level of patient care and handling of medications by outside pharmacies. As a way to validate that outside pharmacies servicing their patients abide by the same standards as BriovaRx—Catamaran’s in-house specialty pharmacy—they require that outside specialty pharmacies servicing their patients complete a credentialing process. The goal is to instill consistency and accountability into the marketplace. In addition to credentialing specialty pharmacies, Catamaran aims to introduce similar requirements to surrounding compounding pharmacies. In addition, Catamaran recently partnered with United Compounding Management, an independent compounding management company, and is in the process of implementing the Network Compound Credentialing Program, which is the industry’s first compound credentialing program, according to Catamaran.4 The focus of the program is similar to the specialty pharmacy network, and will include the development of claims processing standards, medication exclusions, and other additional requirements. Catamaran will require that participants meet the standards of the Pharmacy Compounding Accreditation Board, a division of the ACHC, to be considered for network participation. This accreditation is just one of the many requirements Catamaran has set for compounding pharmacies, with the goal to establish consistency within the growing compounding market and to develop a cost-beneficial network that is more manageable. What does this mean for the dispensing pharmacist? Accreditation points to a new level of minimally acceptable standards for the pharmacy industry. Pharmacists can expect to eventually take part in some form of accreditation. Whether it applies to community, compounding, or any of the other certifications available, accreditation is set to become more of a standard practice than a choice. Although these accrediting bodies work independently, credentialing is becoming more of a standard than an option, and is opening the doors to a multitude of questions: When will accreditation become a requirement for all PBMs and payers? When will nonaccredited community pharmacies begin being carved out of networks? Moving forward, one can expect that PBMs and payers will continue using pharmacy accreditation as leverage when developing their networks to become even more favorable. In addition to other accreditations, CVS Pharmacy was recently granted the new Community Pharmacy Accreditation through URAC, making them the first pharmacy to be awarded the certification.5 The next step will likely be PBMs and payers restricting participant access, or influencing patient choice in favor of accredited community pharmacies. Evidence shows that it has already occurred within the specialty and compounding markets, and as value-based services become an expectation, more standardized protocols will need to be integrated. Having gold standard accrediting bodies certify these services gives patients confidence in their treatment, pharmacies confidence in their services, and payers confidence in the management of their participants. Congressional Budget Office. The budget and economic outlook: 2015 to 2025. www.cbo.gov/sites/default/files/cbo files/attachments/49892-Outlook2015.pdf. Published January 26, 2015. Accessed March 9, 2015. URAC. Accreditation & measurement. www.urac.org/accreditation-and-measurement/accreditation-and-measurement/. Accessed March 2, 2015. Fein AJ. The specialty pharmacy boom continues. www.drugchannels.net/2015/02/the-specialty-pharma cy-boom-continues.html. Published February 3, 2015. Accessed March 2, 2015. Drug Benefit News. Catamaran tests next phase of managing compounds with credentialing program. http://ucmrx.com/wp-content/uploads/2015/02/Drug-Benefit-News_1_23_2015.pdf .Published January 23, 2015. Accessed March 3, 2015. URAC. CVS/pharmacy earns first-ever community pharmacy accreditation from URAC. www.urac.org/news/cvspharmacy-earns-first-ever-community-pharmacy-accredi tation-from-urac/. Published July 31, 2014. Accessed March 9, 2015.